three chapters of the book. 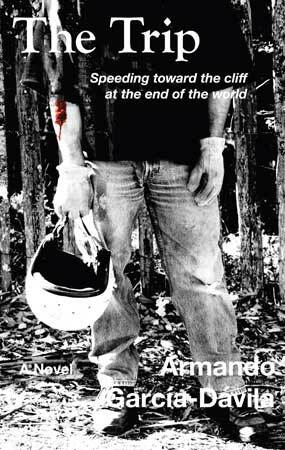 "In defiance of his father’s wish that he enroll in college, Tino Caballero decides to take a long trip on his motorcycle—nicknamed “Rocinante” after Don Quixote’s horse—with his older brother, Sal, a Catholic priest….For Tino, the journey is especially momentous: he loses his virginity, samples drugs for the first time, and flees bigoted Texas Rangers….García-Dávila provocatively mirrors Tino’s own crisis of identity with the nation’s, setting it during one of its most tempestuous decades….An intelligently conceived…historical novel." "Armando García-Dávila takes us on a trip of a lifetime as four friends travel cross-country on their motorcycles in the turbulent 1960s. The experiences of his main character, Tino, are poignant, funny, mind-bending, and life-changing as he grapples with the issues confronting him: his first true love, racial tension, the morality of war, a wafer of LSD in his pocket, and how to gain the respect of his dominating father. Every page is an adventure as Tino matures from a naïve boy into a strong man."